Situated at the end of the Royal Mile in the centre of Edinburgh, against the breathtaking backdrop of Arthur’s Seat, the Palace of Holyroodhouse is absolutely stunning both inside and out. The official Royal residence in Scotland, Her Majesty the Queen conducts important official business here, as well as hosting lavish engagements and garden parties. Take a walk through the exquisitely decorated State Apartments, renowned for their beautiful plasterwork ceilings, historical works of arts and incredible collection of magnificent tapestries. Reflecting the changing tastes of the monarchs through the ages, the scope of decor is impressive. Visit the Throne Room and see where the Knights and Ladies of the Order of the Thistle attend the special luncheon. Enter the Great Gallery, the largest room in the palace, filled with Jacob de Wet’s portraits of legendary Kings of Scotland. These historic apartments were once home to the legendary Mary, Queen of Scots and the location for many dramatic events including the murder of her Italian secretary. 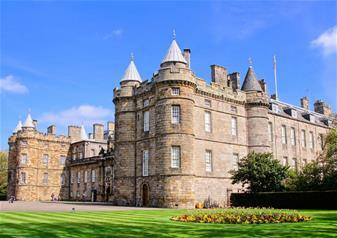 During her short and turbulent reign, Mary resided at Holyroodhouse; visit the Bedchamber, the Outer Chamber and her oratory. Included in entry price, this special exhibition features at the palace from the 15th January until 28th March 2016. See 12 portraits of D-Day veterans; extraordinary men who played an important role in the Allied invasion of Normandy in 1944. Poignant and unique, the portraits were commissioned by HRH The Prince of Wales. Unfortunately, there is no wheelchair access to Mary, Queen of Scots’ Apartments.